Lobster Dog is glad to be back. 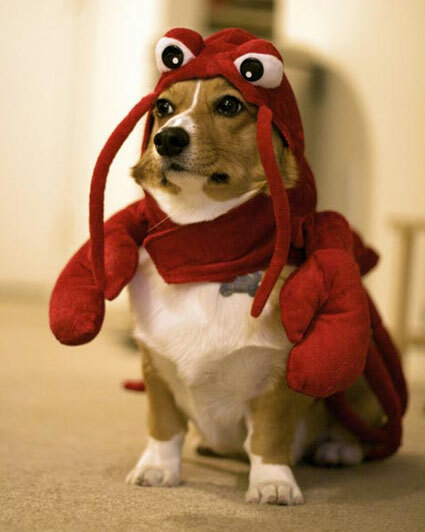 (Image via http://dogfort.wikidot.com/red-lobster). WEATHER: Somewhat humid. Which for DC in July, is completely gloriously beautiful, compared to the usual heavy urban fug of unnatural, can’t-fan-yourself-without-dripping-with-sweat humidity plus bus-farts plus garbage truck waftings. WHERE TO: A little past the C&O Towpath 6-mile marker, then back. Guys, it’s taking a lot of ibuprofen, ice, physical therapy, heel lifts, orthotics, yoga, and elbow grease, but we are back in business <pumps fist, does gratuitous pelvic thrust>. Currently the tentative goal is to do the On the Road for Education (Mason City, IA) marathon in October, assuming my various foot tendons don’t snap/swell to the size of golf balls/punch me in the face. But the REAL goal — dropping the expensive gym membership, throwing a few gels in the sports bra, and occasionally nearly-heaving in the bushes next to the C&O towpath — well, that has been met. And there is much rejoicing. Q: How well do you expect to do in the Mason City marathon? A: Very well — top 30 among women, I’m thinking. Q: That’s ambitious. Are you sure you can do it? Q: Wait. Weren’t there only 26 female finishers last year? Q: How are your feet? A: The tendons are sort of sore, but I did today have my first broken-off toenail incident in years. A: Like drinking the blood of a unicorn-magical koala hybrid. Like staring Sauron in the face and then kneeing him in the balls. Like going on a piggyback ride on Sasquatch through the peppermint forest. Like victory. Also, like knowing I’ll have one hell of an ingrown toenail in a few weeks. Q: Uh-huh. Are you, as we speak, sitting on your futon and barely breathing as you attempt to slowly lower your heels into the absolute-effing-zero-ice-bucket-of-pain? A: I prefer to refer to it as the absolute-effing-zero-ice-bucket-of-pain-and-redemption. Q: Have you written a song about recovery? I got my feet back. Q: <wipes tears> That’s very moving.